Join the Reflections Scooter Society in celebrating our anniversary & the debut of our Halloween Poker Run. Pick up cards as we ride to some of the spookiest stops in Los Angeles, best hand wins, costumes encouraged! The ride culminates at Sabor Lounge as Lawless Street in association with A & M Entertainment presents Jah Abiding Citizens, The Roundabouts, and Manganista! Come on out and show us your Halloween spirit. Meetup: October 26, 8:00pm Sabor y Cultura in Hollywood. Ride leaves promptly at 8:30. Saturday, Meet at noon in Riverside at the Royal Falconer Pub, 4281 Main St. on the corner of Main and 13th off of Market St.
Sunday, meet at the Legends Hamburger joint in Rancho Cucamonga on the corner of Mountain and 16th (Baseline). Also meets at noon. These are the best rides in socal, better than riding in traffic around industrial areas at the docks!! We will be stopping for gas, so don’t worry about that. Don’t bring any slow bikes either. Meet at 12:30pm at Claim Jumper restaurant in Torrance (corner of Lomita and Crenshaw Blvds); Ride leaves at 1pm-ish. Come on out for the longest-running, regular ride in SoCal: the South Bay Scooter Club's Monthly Ride! Come join us at Woodley Park, Van Nuys for a day with the best of French and Italian motoring machinery. This a non-judged show, from the rough restoration project to the serious concours offering. All are welcome, and our pricing structure is geared toward the collector with more than one vehicle. If you don't have a car, plenty will be for sale amongst the rows of gleaming machinery. The intent of this gathering is to provide a meeting place for those marques that get little attention at the fancier concours. If you're looking to unload the garage or for that special part, check out our swap meet. A parking area is provided for trailers and tow vehicles. Food will be available or bring a picnic (no alcohol please). Contact us at info@franceanditaly.com or by voice, (626) 797-4221. Come be a part of scooter history and ride in one of the oldest scooter rallies in the South West U.S. The rally begins at the Hotel Congress in historic downtown Tucson. Come down on the 9th starting at 6pm for rally registration, mingling, music, drinks and, of course, scooters. The hotel fills up very quickly, so click on the link below to reserve your room NOW! FYI the hotel does supply secured scooter parking. Saturday morning, the rally departs from the Hotel Congress for a 125-mile ride through the beautiful scenic landscape of southwestern Arizona. We will have a mid-way stop in the rustic town of Patagonia for gas, drinks and to stretch our legs. From Patagonia, we will continue on through Nogales, Arizona to our legendary, isolated, reserved, group campsite in the Coronado National Forest. At the Calabasas campsite, we will be greeted by a catered BBQ, multiple kegs of beer, music and a bonfire. Several campsites, firepits, firewood and restroom are available. It can get cold at the campsite, so don't forget tents, sleeping bags and other camping gear. Sunday, we will awaken from our hangovers for a Mexican breakfast of eggs, potatoes, coffee, chorizo, tortillas and menudo. Attention: Any scooter clubs, old or new, that have participated in this historic scooter rally in the past, please contact Matthew in order for your club to receive acknowledgement at this years rally. The Stingers SC in Riverside put on their 6th annual Oak Glen Apple Ride this year. Yeah, we’ve been doing this for six years now, and I know it’s the same weekend as Tucson/Nogales, but what the hell, if you can’t make that one, come out to Riverside for what is always a very cool ride full of twisties and fast roads. This is a vintage & modern friendly ride; it’s always been. The ride is usually about 100 miles round trip, most of which will be under 50mph. There is an elevation climb by the time we reach Oak Glen, so be prepared for a climb before getting to Oak Glen. Like always, patches are free. Meet and greet at the Royal Falconer in Downtown Riverside at 7:00pm, ride leaves around but not exactly at 9:00pm. Meet up at the parking lot across the corner from the Royal Falconer at 10:30am, ride leaves around but not exactly at 11:30am. The Long Beach Classic Scooter Club , Diablos Scooter Cult & Jackalopes SC have announced their first “Classic Not Plastic” Scooter Rally, scheduled for November 23rd – 24th, 2007. Obviously, this rally will be for Classic/Vintage scooters only. Come join our Holiday tradition of riding to and through the famous South Bay X-Mas Lights Neighborhood (a tract of houses that go absolutely bonkers decorating their houses with X-mas lights, moving Christmas figures and holiday lawn displays). This is always followed by our club’s annual Holiday Party. All are welcome!! Meet at Claim Jumper’s restaurant (corner of Crenshaw & Lomita Blvd.’s) in Torrance at 4pm; ride leaves promptly at 5pm! Don’t forget to DRESS WARM!! December's regular SOUTH BAY SCOOTER CLUB'S monthly ride will be postponed from December 1st to December 8th so that we can ride over to the International Motorcycle Show at the Long Beach Convention Center. Piaggio, as always, will have a booth at the show. Meet at Claim Jumper in Torrance (corner of Crenshaw and Lomita Blvds) at 11am; Ride leaves at 11:30am for the show. Westside Holiday Party will be happening at CLUB SOULSIDE the evening of Dec 8th. Come out for an annual South Bay tradition: riding our scoots to the beach, taking pictures and sending them to all our relatives shivering in the snow or rain, lol! First Saturday of every new year!!! Put it on your Calendar. More details soon. last call, LAST ONE, THIS IS IT! This years price is 20 dollars which includes campsite fees, and all the food, and beer and soda at the campsite plus embroidered patch. FRIDAY APRIL 25 - Meet and Greet - Meet at Zingo’s Cafe 3201 Buck Owens Blvd. Ride through Bakersfield leaves at 9 p.m. THIS MIGHT CHANGE THIS YEAR. SATURDAY APRIL 26 - Meet at Beach Park at 11 a.m. Beach Park is located at 24th Street and Oak Street - Bakersfield, CA. Entrance is on 21st Street. Just off the 99 freeway, downtown/178 west exit. Ride leaves at 1 p.m. We will stop for gas at the edge of town. Ride to the campground: The ride to the campground is about 60 miles. If you can’t make that distance on a tank of gas, you may need to bring a gas can. Bikes must be able to hold 45 mph on the open roads please, otherwise, all bikes are welcome. Your bike MUST be in good condition as this is a mountain ride. Your brakes and tires must be up to the task. (Not to scare anyone off, this ride is incredibly fun but we will be away from most conveniences and hospitals so we don’t want anybody to get hurt due to their bike being in unsafe condition). You will be allowed to ride at your own skill level. If you aren’t as steady through winding roads as other riders, don’t sweat it, you can work your way through, we won’t leave you on your own. We’ll take care of you. For the rest of the night, we drain kegs, eat hamburgers and hot dogs [I realize some scooterists are vegetarians, if enough plant eaters let us know they are coming, we will try to have some gardenburgers on hand for you, if we don’t know you are coming, you’ll have to fend for yourself =P ]. The DJ’s will crank up the music, don’t be afraid to dance. The bathrooms are indoor, lit with running water, there is even a shower! ALSO, DON’T FORGET THE RAFFLE!! This years GRAND PRIZE is a VESPA P200e !! SUNDAY APRIL 27 - Wake up and get ready for the ride back to town. Ride leaves at 11 a.m. (or as soon as the campsite is cleaned haha). 40 miles through the Kern Canyon along the Killer Kern River back to Beach Park. 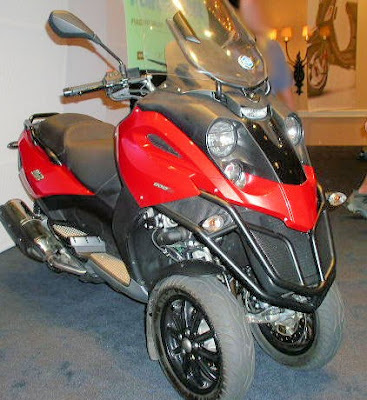 The Piaggio MP3-400 (In the current MP3 body style except with the extra power we've all been waiting for) will be arriving at dealerships as soon as January. The Piaggio MP3-500 (A rebadged Gilera Fuoco 500) will arrive around March with an expected MSRP approaching the $10k mark. Well, what did you expect? Hotness has a price. The elusive Vespa S (the cute one with the thin leg shields and rectangular headlight) is supposed to arrive before Q2, 2008 with a 150cc engine and an MSRP of about $4,000. "Per a reliable source on Modern Vespa"
The 250 will be $7199 next year (They are $6999 right now). The 400 will be $8699 and the 500 will be $8899. For the full blog, go to the ScooterScoop's blog about this.